[San Fernando Valley State College] had just opened when I came. I came from Valley Junior College [Los Angeles Valley College], over on Fulton Avenue. And I did two years there, and then realized that this was a good spot to come into, at the end of my two years, to complete my degree. That would have been in 1957. Dr. Schwartz was the chairman of that department [Education], and he was also the main teacher in getting us into training. Everything I took was geared toward teaching. For example, the Music Department with Dr. Ryan was learning to teach music in the schools. And the same was true with the Physical Training [Phys Ed], which was Mrs. Fisher, as I recall — there again, we were given ideas about incorporating it into our teaching. I was older, because I put my husband through college first, and then he decided that he would put me through college. . . I think I had an advantage as far as my age was concerned, because I thoroughly loved it, and I got a lot out of all my classes because I enjoyed coming and studying, so in that respect it [San Fernando Valley State College] had a lot to offer and I appreciated it as far as the professors and just being a new college was great for me too. I think it’s been a fantastic thing for the valley to have this university and it seems to be better each year as far as things that are offered and then the community involvement as far as Northridge is concerned, I think it’s great. It’s a wonderful thing for our community. It was just an overall wonderful accomplishment for me to be able to finish and get through in four years — which doesn’t happen too often. — and then also getting the teaching credential to me was like an insurance policy, so wherever we might go I could use it, and it wasn’t until two years ago that I stopped with my substitute work. I enjoyed that thoroughly throughout the valley. Hi, I’m Amy Reichbach. I am an alum of Cal State University Northridge. I graduated in 1977. I now work here as a health educator in the Klotz Student Health Center. I love being a health educator. I have contacts with students from – I’ve been here 19 years now as a staff member – I still have contacts from at least 12 to 15 years ago. Students stay in touch with me. People still say, you know, “You made a difference in my life,” and that’s what I like about my job. I think the other thing that helped motivate me was when I came here, one of my mentors was the woman for whom the Health Center is named, Addie Lou Klotz, and I met her through my journalism teacher . . . I met her when I was still in high school, and she encouraged me to come here too, and she encouraged me to be in Health Sciences. 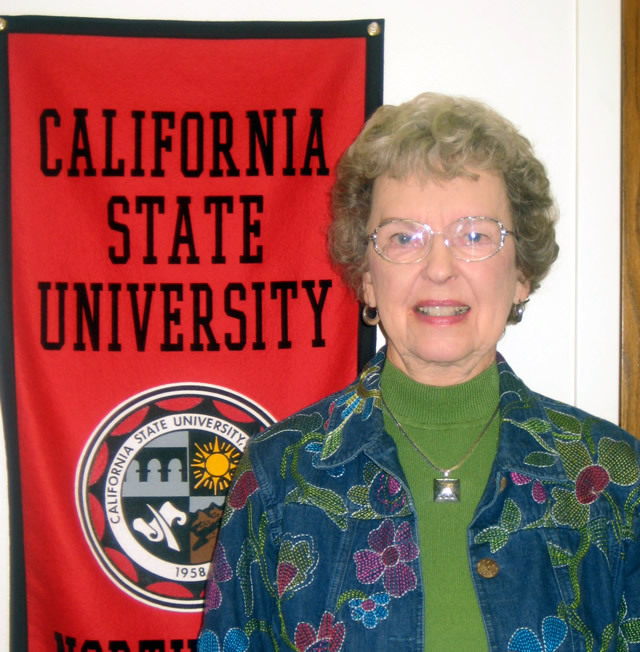 She was the first director of the Student Health Center here. And so she was the first director. 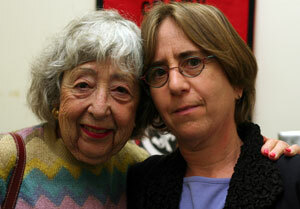 She mentored me, she taught me a lot about being in health education. She was the first person I knew that had an MPH, a masters in public health, along with her MD degree, and I adored her. I was here for groundbreaking [of the Klotz Health Center], I wanted to come and work for her. [Even though CSUN has grown] there are things that galvanize the community. In 1992, I think and again in ’95 I spearheaded a drive to bring the Names Project AIDS Memorial Quilt to campus, and it was a collaborative effort. The premise had to be that nobody got charged any money to come view the quilt. So everything had to be donated, and what I found in terms of building relationships — from President Blenda Wilson on down, in those days — is it’s still possible to do that, no matter how big you are. I got to know people on all levels, from the custodial staff up to the president’s office, to make this event happen, and everybody cared about it and everybody came. It was possible, even in those times, to build relationships that cross all levels of campus and everybody knew everybody for a common goal. I think those things are still possible, despite how big we are. I am Dr. Edward Reichbach (I differ with my daughter, I go with the original Austrian pronunciation). I graduated with a Master’s. I went on and got my doctorate and wound up teaching at Florida International University in Miami, and I credit Cal State Northridge — now — with getting me into administration because that’s what my degree was in, and that helped me immeasurably. When I first came here this was a branch of L. A. 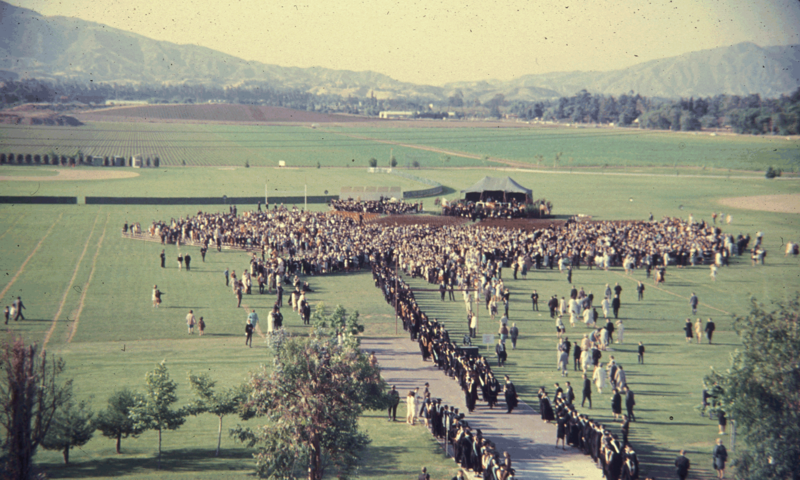 State College [now CSU Los Angeles]. It was orange groves and Devonshire Downs which was a state or county fairgrounds. It was large tents, tentlike buildings, and all of a sudden there were portables dropped. There were many veterans like myself attending. There were also people who lived at this end of the valley who didn’t want to go all the way back to Vermont Ave. to go back to L.A. State and since the branch was open and it was accredited, we could finish our degrees. All this — there were wheat fields along Sepulveda Blvd. and as you climbed the hill, it was ranches, cattle. . . And to see a small college starting here was just amazing to me. I always thought this would be rural for the rest of my life. I remember Delmar [Oviatt]. He was the first Dean of the College of Education — I think it was the School of Education, because there were no doctorates at the time. He was open. You could talk to him anytime, because we were small enough. And I remember going up the first time and seeing him and I said “Dean how are you?” and he says “Wait a minute I remember you, you were down on Vermont,” “yeah right,” and it was just an open, because we were small, everyone knew everybody, so it was really a nice way to fall into graduate school. I was on the tag-end of the first wave [of faculty], or the front end of the second wave. And it was quite a thing to recognize it when I came on campus. 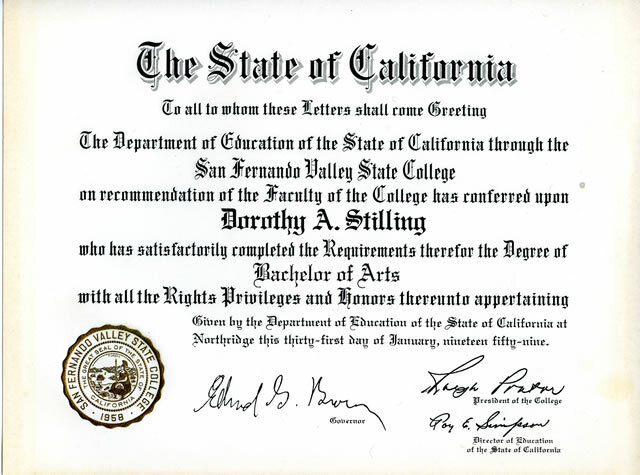 There were a lot of people with fine backgrounds that were already in the nucleus of the faculty that was of San Fernando Valley State College. I was hired by a man by the name of Erling Erlandson. 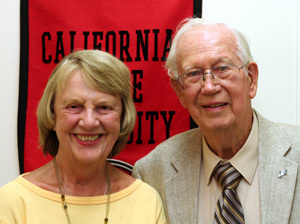 He was the founder of the Journalism department here, and he had come from USC, where he was on the faculty, and had been honored at USC as a distinguished professor in journalism. So he came here, and he indeed was a distinguished professor, and it was an honor to join Erl in that experience. So there were the two of us who were beginning the journalism program here. I was hired by Ralph Prator, and Ralph Prator was a fellow who was easy to know. He was so outgoing. From the beginning, as a faculty member, I respected the administration, but was not in awe of the administration — they don’t know all of the answers. 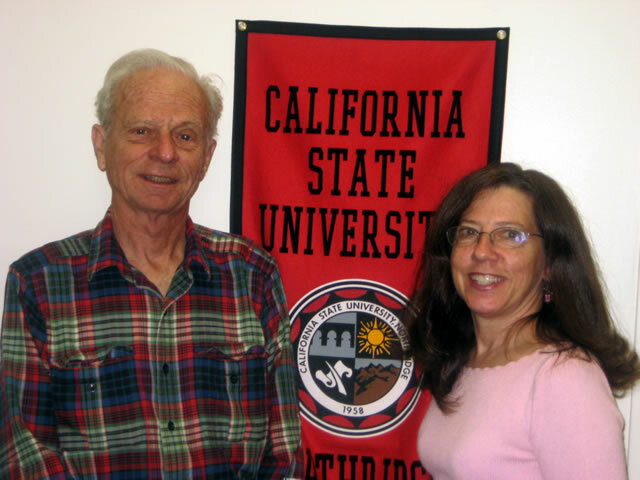 But Ralph was really a wonderful man to know, and he treated me as a friend, and well as a faculty member. But if I had opinions as a friend or as a faculty member, he was a good person to talk to. (addressing Mrs. Stelck) You went as my guest at the 50th anniversary gathering of journalism alumni. It was on the pier on Santa Monica, in the shadow of the wonderful merry-go-round. One of my former students, Russ Bernard, owns a restaurant right adjacent to that merry-go-round in Santa Monica. So we went there for the 50th anniversary gathering. And — I don’t know how many — it seemed, hundreds of students, but in that noisy restaurant — I just stood there by the [bar], but the former students came round to shake my hand, and say how great it was to see me, and to my credit, I remembered them Sometimes I had a little help on their names, but, coming back, 50 years later, here are people and they’re — “what are you doing now?” Well, they were newspaper publishers, they were writers, they were any number of exalted positions — public information officers. . . I tell you, just a cross-section of journalists in this country were there. And it was just great, because I would recognize them, and then — “what are you doing?” and boy, I tell you, it was just wonderful. I decided — along with a lot of other faculty wives who’d just arrived — that it would be wonderful if we could get together as a family and get our children playing together, and maybe taking swimming lessons together, and doing those kinds of things. So we organized the Faculty Wives group. And everyone was very, very eager to participate in this, and we had wonderful activities. We had a huge Christmas party for our children, and we had swimming lessons, we had parties. . . And then we had our faculty band, and we had our own parties at the Cafeteria — decorated the Cafeteria beautifully. Char Sellers, one of our very artistic members would decorate this so beautifully, and that’s where we would have our Christmas party. And we were so fortunate to have that, because we were all very, very broke. . ..
Well, we decided that there were many students that wanted to come to this University, but just didn’t have the money, and if we could help them in any way– So we decided we were going to give scholarships, but we didn’t have any money to give the scholarships, so we’d bake cakes. We had a lot of bake sales on the campus. The cookies went so fast, and the cakes went so fast, that we could hardly get them on the campus before they were gone. And then we decided to give rummage sales, and they were very, very popular. So we were able to raise quite a bit of money, and we had to turn it over to the [University] Foundation, and the Foundation invested it for us, and it was a very, very good time for investments — they did a very good job. And before long, we were ready to give our first scholarships, which were $100 scholarships. And for years and years, now we have given four scholarships of $1,500 each.